Strongs Eye View: The Smithdown Barber Shop Quartet! The Smithdown Barber Shop Quartet! 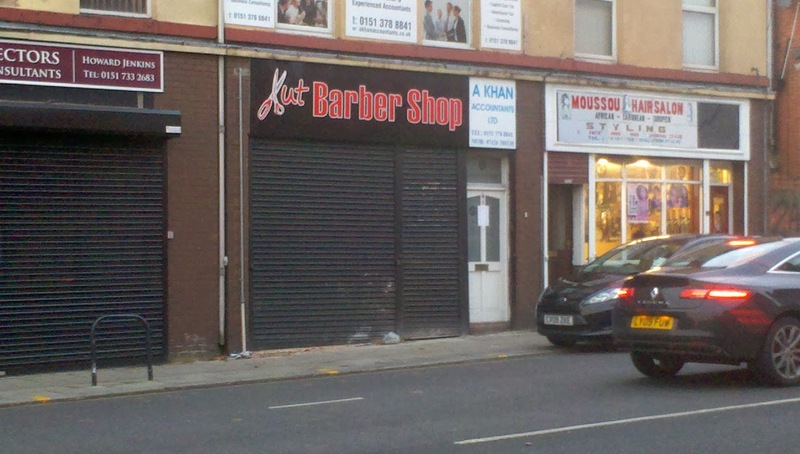 Unfortunately it's not a singing quartet, it's four barbers which are all really close to each other. 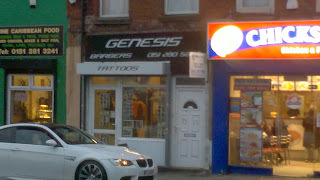 We'll start with Genesis. As that seems like a good place to start. Obviously the name is in reference to that book. You know, This one. 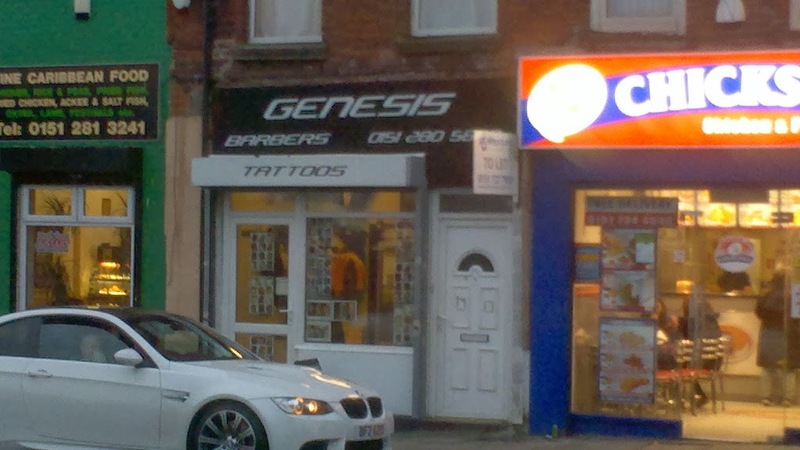 You may notice that Genesis also offers tattoos and for the right price you can have a tattoo of your old hair style before they cut it in case you miss your old do. Well I'm not exactly sure what it's called, it could be Ut Barber Shop or maybe Xut Barber Shop or most likely it's supposed to be Cut Barber Shop, although those scissors look nothing like a 'c'. Anyway you look at it it's a terrible name. They should have just called it The Barber Shop. 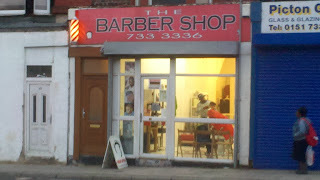 The Barber Shop, using all of their creativity and wit came up with the name 'The Barber Shop'. I mean fair enough it does do what it says on the tin but they could have called it anything. Snippy Joes, Time for a trim, Mop Tops, The Cutty Sark, Do the Do, The Flair Gut Wear Shut Hair cut! The Barber Shop. 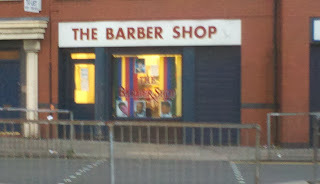 Now, this 'The Barber Shop' is clearly nothing to do with the other 'The Barber Shop'. It's bad enough that one barber shop lacked the creativity to call their barber shop anything other than 'The Barber Shop' but two, come on! 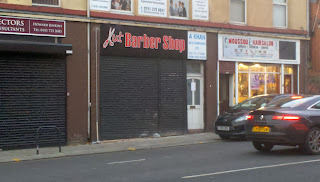 I don't know which 'The Barber Shop' came first and whether or not the second was aware of the first when it opened but I feel that if you are going to open a barber shop and call it 'The Barber Shop' you really should check that there isn't already a barber shop called 'The Barber Shop' nearby. But there they both are. I mean I suppose it is possible for different shops near each other to have the same name and ownership but I don't think that's the case with 'The Barber Shop' and 'The Barber Shop', but I know it can happen a bit further down the road there are four related shops called Day & Night all within about a meter of each other. Anyway I feel the title promised some Barber Shop music so I'll finish with this. P.S. 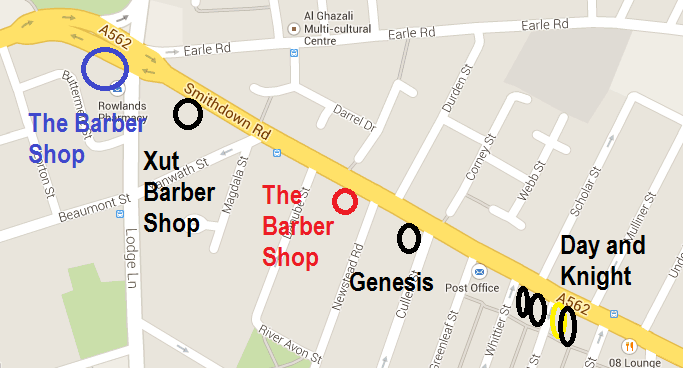 Here is a map showing the locations of all shops mentioned.